� Presented in the symposium on Nutrition in Early Childhood and its Long-Term Functional Significance, FASEB, April 6, 1992, Anaheim, CA. Published as a supplement to The Journal of Nutrition. Guest editors for this supplement publication were Reynaldo Martorell, The Rollins School of Public Health of Emory University, Atlanta, GA and Nevin Scrimshaw, The United Nations University, Boston, MA. � The Nutrition CRSP was supported by USAID grants no. DAN1309-G-SS1070-00 and DAN-1309-A-00-9090-00. � To whom correspondence should be addressed: Department of Nutrition, University of California, Davis, Meyer Hall, Room 3135, Davis, CA 95616. ABSTRACT The overall objective of both the Institute of Nutrition of Central America and Panama (INCAP) studies and the Nutrition Collaborative Research Support Program (CRSP) was to determine if marginal malnutrition affects human function. The conclusions from the two studies were consistent, notably that growth stunting occurs early in life and is accompanied by functional impairments. These consequences of early malnutrition persist later in life. The comparison of INCAP and Nutrition CRSP results also illustrates that the Cuatemalan children were more malnourished and stunted than those in Kenya, Mexico or Egypt and that this greater degree of stunting occurs before 18 months of age. Even the Atole did not bring the average size of supplemented children in Guatemala up to those of the unsupplemented children in the CRSP populations. It is also likely that their functional potential was not realized fully by supplementation. The CRSP studies provide evidence of multiple micronutrient deficiencies associated with poor growth and function and it is probable that these associations exist in Guatemala as well. The overall conclusion is that our attention should be directed to determining the adequacy of micronutrient status in the perinatal period and to the development of approaches that prevent early growth failure. J. Nutr. 125: 1119S-1126S, 1995. The Institute of Nutrition of Central America and Panama (INCAP) studies described in the preceding articles and the Nutrition Collaborative Research Support Program (CRSP) are two of the largest field investigations of marginal malnutrition ever conducted. Such studies are inherently difficult to design, conduct and control so that the interpretation of their results is always open to question. Because the INCAP and CRSP research had similar goals and measured many of the same outcomes and possible confounding variables, a comparison of the results can extend the generalizability of the conclusions and add new insights into their interpretation. There is no doubt that the general conclusions from the two studies are in agreement and are useful for developing appropriate nutrition policy. However, some important unanswered questions also emerge from this comparison. Both projects had the main goal of testing whether marginal malnutrition affects human function. The major hypothesis addressed by the original design of the INCAP longitudinal study (1969-77) was that improved nutrition results in accelerated physical growth and mental development of preschool-aged children; in the follow-up study the hypothesis was extended to apply to the same children at adolescence or adulthood (Martorell et al. 1995a). The major CRSP hypothesis was that marginal malnutrition affects function, namely growth, cognitive performance/behavior, morbidity, reproduction and social competence (Calloway et al. 1988). There are marked similarities and differences between the studies. The INCAP project was located in rural Guatemala and the Nutrition CRSP was located in rural Kenya and Mexico and a periurban area of Egypt. The CRSP was conducted in three locations to test the generalizability of the results across different staple diets, environments and cultures. Nevertheless, the CRSP investigators worked together closely to ensure that the types of data collected and the research methods were as similar as possible across the three projects. In general, based on anthropometry and dietary information, the nutritional status of the populations was poorest in Kenya, where famines occurred during the project, intermediate in Mexico and best in Egypt. The CRSP results discussed in this article are described in detail elsewhere (Allen et al. 1992a, Allen 1993, Calloway et al. 1992, Kirksey et al. 1992, Neumann et al. 1992). The original INCAP study was a controlled intervention design, providing energy and protein supplements for pregnant women and children under seven years of age (Martorell et al. l995a). When this project was designed it was the current belief that protein would be the critical growth-limiting nutrient. INCAP analyses have tended to focus on comparisons of Atole and Fresco groups and to analyses of the relationship between supplement intake, often expressed as energy, and outcomes (Habicht et al. 1995). The Nutrition CRSP was a nonintervention observational study in which the intent was to describe relationships between intake and function of several household members consuming their usual diet. When the CRSP was designed, in the late 1970s and early 1980s, it was believed that inadequate energy (food) intake was the dietary problem most likely to limit growth and other human functions (National Research Council, 1977). Thus, energy intake was the main independent variable. However, because energy intake was assessed by frequent measurements of food intake, the consumption of other nutrients and food intake patterns were also used as independent variables during subsequent data analyses. Pregnant and lactating women, and children were subjects in both studies. The INCAP project was longitudinal, originally studying children for up to 7 y of age and, in the follow-up, adolescents and adults. The CRSP only followed each type of "target" subject for 1 y, or slightly longer for most pregnant or lactating women. CRSP subjects also included schoolers, adult males and nonpregnant nonlactating women. Many similar functional outcomes of nutritional status were measured, including maternal and child anthropometry and cognitive development and behavior. Morbidity and socioeconomic and demographic data were used as potential confounding variables. The INCAP follow-up study included work capacity measures (Haas et al. 1995) whereas the CRSP has information on the observed activity patterns of some preschoolers and adults. In general, the CRSP focused more on food intake data, measuring 2 days of intake per month during the year of study, on each individual as well as at the household level. Dietary variables constructed during data analysis included micronutrient intakes, estimates of mineral bioavailability and food patterns. Hematological and biochemical measures, included to examine potential confounding effects of vitamin and mineral (primarily iron) deficiency in functional tests, provided an indication of the status of some micronutrients. The INCAP longitudinal study (1969-77), similar to many previous and subsequent studies in developing countries, showed that growth stunting occurred very early in life. The follow-up study was relatively unique in that it followed the same individuals in late adolescence and adulthood, so proving that this early growth failure persisted (Martorell et al. 1995b). The CRSP does not have equivalent longitudinal data across childhood and adolescence because each individual was followed for only 1 year. However, because infants, preschoolers and schoolers were studied from the same sample of households, it is reasonable to compare growth at these ages and make some inference about the longitudinal development of the CRSP children. One of the most important conclusions from the INCAP follow-up is that size (length) at 3 y of age is a strong predictor of adolescent size (Martorell et al. 1992; Rivera et al. 1995). The situation seems to be similar in the Nutrition CRSP. Figure 1 shows the length/height Z-scores of the target children in each country, in each target age group. At birth, infants were slightly shorter than reference values (Hamill et al. 1979) in all three countries. The most rapid period of growth failure started at ~3-4 mo after birth. Growth stunting relative to the reference values essentially was complete before 18 mo, the age at which Observations were started on preschoolers; length Z-scores actually improved slightly between 18 and 30 mo of age. In Egypt, height Z-scores improved slightly for schoolers, but comparison with crosssectional data on adolescents in the same households and with the adult target subjects suggests that in none of the three CRSP locations will there be a significant change in height status during adolescence. The INCAP followup supports this assumption, because growth in adolescence occurred at a rate similar to that of adolescents in the United States (Martorell et al. 1995b). The pattern for weight Z-scores in the CRSP was similar to that for height, although these were higher than those for height at all ages. Because both height and weight were stunted, weight-for-height was relatively normal at all ages. Weight-for-height was also relatively normal in Guatemala, in both initial (Martorell et al. 1982) and follow-up studies (Rivers et al. 1995). FIGURE 1 Height Z-scores of target children in the Nutrition CRSP compared with the Guatemalan children. E = Egypt; M = Mexico; K = Kenya; GS = Guatemalans supplemented with Atole; GNS = Guatemalans supplemented with Fresco. CRSP children were 30 mo old and Guatemalans were 36 ma old. A Z-score of zero represents the NCHS reference value at each age. INCAP studies indicate that short size was associated with adverse cognitive and behavioral outcomes in infancy and childhood (Lasky et al. 1981) and that this association persisted to adulthood (Martorell et al. 1992). It is somewhat difficult to compare specific outcomes across the studies because there were differences among tests and many of the scores were grouped or scaled differently during analysis. However, it is clear that short stature also predicted poorer outcomes in the Nutrition CRSP. Most of the associations between height and these functional outcomes in both the INCAP and CRSP subjects were identified in multivariate analyses that controlled for variables such as socioeconomic status, years of schooling and parental and household factors. CRSP preschoolers who were taller, in Kenya and Mexico but not Egypt, had better cognitive and behavioral performance. In Mexico, the taller preschoolers performed better on the Bayley Mental examination (Allen et al. 1992a). They played, verbalized and interacted more frequently and were crying or doing nothing (apathetic) less often (Allen et al. l992a, Scanlon 1989). In Kenya, less-stunted preschoolers had higher scores on the Bayley Mental and Motor tests and played and verbalized more (Sigman et al. 1989a). In general, similar associations were seen with weight but not with weight-for-height. In schoolers, cognitive scores and verbal comprehension, behavior and school performance tended to be even more strongly correlated with height and weight (Allen et al. 1992a, Oh 1990, Sigman et al. 1989b). Although schoolers' size was probably predominantly determined by the second year of life, we assume that longer exposure to an inadequate diet and performance deficits already obvious in the preschool period created cumulative deficits in the children's performance. Both the CRSP and INCAP data provide very strong evidence that early growth stunting predicts both current and later functional performance of individuals. Certainly, it can no longer be argued that small size is an adaptation to malnutrition, reducing the lifelong need for food but unaccompanied by ill health or poor function (Heckler 1980). This moves us to the need for a new research agenda, which is to understand the reasons why growth stunting occurs in developing countries and the extent to which poor dietary patterns and specific nutrient deficiencies are responsible. A comparison of the INCAP and CRSP results provides some insight into this question, although not nearly enough. Comparing the height Z-scores of the CRSP and INCAP preschoolers illustrates the relative degree of early malnutrition across projects Fig. 1). The closest ages for which published data are available for comparison are 30 mo in the CRSP populations and 36 mo in the Guatemalan children. This comparison illustrates the important point that the Guatemalan children were substantially shorter than in the other three countries, even after supplementation with Atole. Thus, it is likely that the Guatemalan children were by far the most malnourished group. These differences in nutritional status should be attributable to differences in dietary patterns or nutrient intake. The dietary patterns across the three Nutrition CRSP countries are described in Table 1 (Calloway et al. 1992). Mexico and, to a substantial extent, Kenya is similar to Guatemala in that maize and beans supply a large proportion of the dietary energy. Egypt uses more wheat and rice. Animal product and fat consumption is low in all three locations, especially in Kenya and Mexico, where intakes of these dietary constituents are most similar to those in Guatemala. � From analyses by Calloway et al. (1992). � To obtain kilojoules, multiply kilocalories by 4.184. The energy intakes of the children in the four locations are shown in Table 2. For the CRSP projects the values represent average energy intakes between 18 and 30 mo of age (Beaton et al. 1992). For the Guatemalan children the data are an average of intakes between 15 and 36 mo, from the home diets of the Fresco group and excluding the small amount of energy provided by this supplement (Martorell et al. 1982). 1 Values are means � SD. Data for CRSP locations are from Beaton et al. (1992). Values for Guatemala are calculated from Martorell et al. (1982). Clearly, there is a gradation of energy intake across the projects. The CRSP analyses showed that energy intake was adequate for the Egyptian and Mexican preschoolers. In Kenya, where food shortages occurred during the project, energy intakes averaged less than recommended levels. The Guatemalan children consumed even less energy from their home diets than the Kenyan children. Protein intakes followed a similar pattern because the correlation between protein and energy intake is very high in these populations. In the CRSP, the calculated probability of digestible protein and essential amino acid intakes being inadequate was essentially zero (Beaton 1992).et al. 1992). In Guatemala, protein intake is likely to be adequate for those children consuming adequate amounts of energy, but not otherwise (Town and Viteri 1981). Because energy intake was inadequate for some Kenyan and Guatemalan children, an energy supplement, such as the Atole used as one of the INCAP supplements, would be expected to benefit the growth of the Guatemalan children and, to a lesser extent, the Kenyan children. Intervention with dietary energy would not be expected to improve the linear growth of the Egyptian or Mexican groups. This is supported by the fact that in both Kenya (Neumann et al. 1992) and Guatemala (Martorell et al. 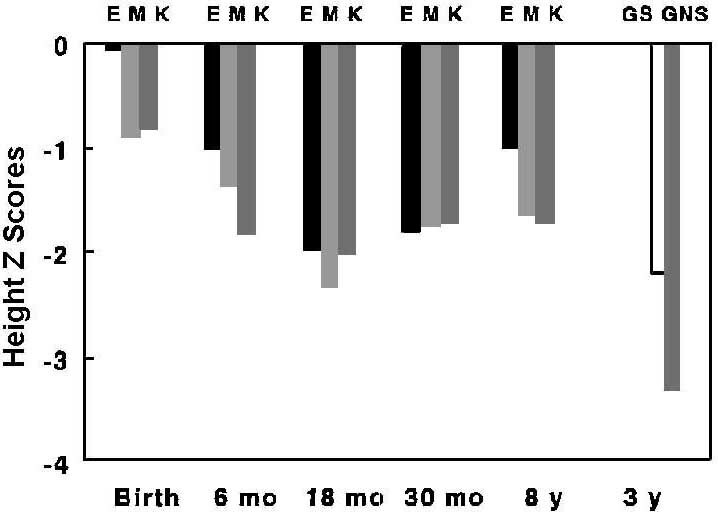 1982) the children's energy intake during the preceding 12 mo was a predictor of their height at 30 mo (Kenya) and 36 mo (Guatemala) and of functional outcomes. In Egypt (Kirksey et al. 1992) and Mexico (Allen et al. 1992b), where food shortage was not seen, dietary energy intake was not associated with growth or other functions.